Dr. Cheryl Adkins is originally from St. Louis, Missouri. She graduated high school from St. Joseph’s Academy in 2001. Her undergraduate studies in Animal Science were done at University of Missouri-Columbia before she was accepted to the Veterinary College at the University of Missouri-Columbia and graduated in 2008. She was hired right out of veterinary school in 2008 and has been here ever since. When she is not at work, Dr. Adkins is a voracious reader, hiker, movie watcher, and she plays video games with her husband. Her children, 2 dogs, and 4 cats keep her entertained at home. Dr. Megan Hillard is a 2010 graduate from LSU College of Veterinary Medicine. Originally a home town girl from here in Fort Smith, Arkansas, she completed her undergraduate studies in Animal Science from the University of Arkansas in 2006. She spent 2011 in Orlando, FL for intense training at a specialty hospital. Her veterinary interests include internal medicine, surgery, and neurology. She joined the Labahn team in 2013. During her free time she enjoys being a mom to one beautiful little boy, reading, going to movies, and hanging with friends and family at Lake Ouichita. Dr. Hillard has a cat named Georgia. Labahn Veterinary Hospital is proud to introduce our new associate veterinarian, Dr. Theresa Schluterman, DVM. Dr. Schluterman has practiced Veterinary Medicine in the local area for almost 22 years and will continue to serve area clients and pets here at Labahn. She stays busy outside of work with her son, outdoor activities, and a large group of pets of her own. Please join us in welcoming Dr. Theresa Schluterman to our practice! Dani has been with Labahn since 2006. You’ve likely seen her working in all areas of the hospital, but she has recently accepted the position of Veterinary Practice Manager. 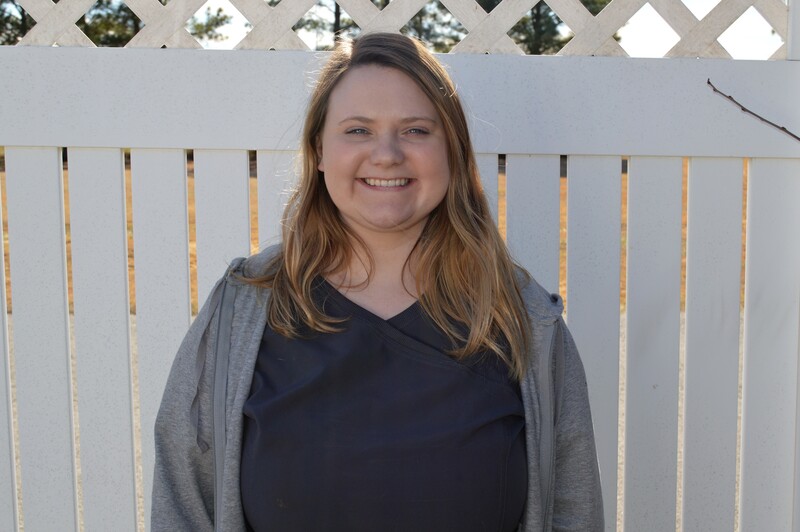 Dani may spend less time with your pets now but will stay busy training staff, assisting the practice owners, and helping to provide excellent customer service. If you have any compliments, questions or concerns please ask to speak with Dani and she will be happy to assist you. Leslie joined the Labahn team in 2015. She graduated from Northside High School in 2010 and then from UAFS in 2014 with a Bachelor of Science in Biology. She brings an avid desire to meet and get to know all who walk into our office, regardless of species. She is able to offer assistance in both English and Spanish. When not at work she enjoys looking after animals and reads extensively. Jeff graduated from UAFS in 2014 with his degree in surgical technology and was hired at Labahn that same year. His primary role here is to assist the doctors during surgery, but you can also see him in exam rooms assisting. He has two cats named Panzar and Bear, whom are very spoiled but very loved. He is hoping to add a dog to the mix in the near future. In his time off he likes doing P90X to stay healthy. Overall he says, “I enjoy my job because you never know what you’ll see from one day to the next, and I enjoy learning and helping people”. Loren is very excited to be working at Labahn. She loves meeting the clients and learning new things every day. Loren is pursuing a biology degree at UAFS and she hopes to attend veterinary school after she graduates. In her free time she enjoys spending time with her dogs Marley, Bella, and Annie. 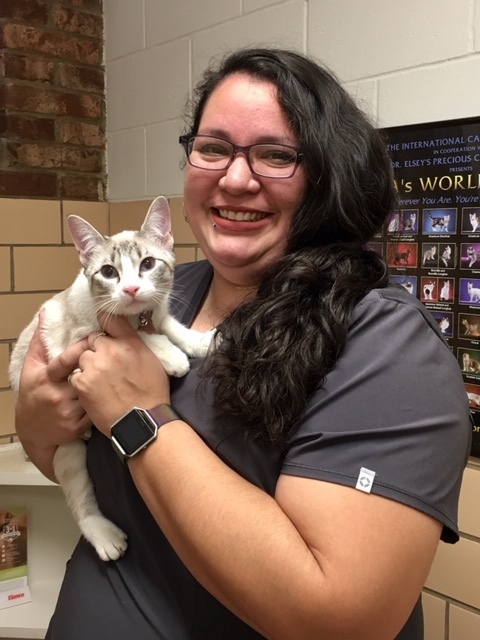 Jessica recently joined our team as a pet nurse. She grew up in Mountainburg and has 2 German Shepherds named Bosco and Stella. Jessica enjoys riding motorcycles and crafting at home, in addition to her love of cooking. 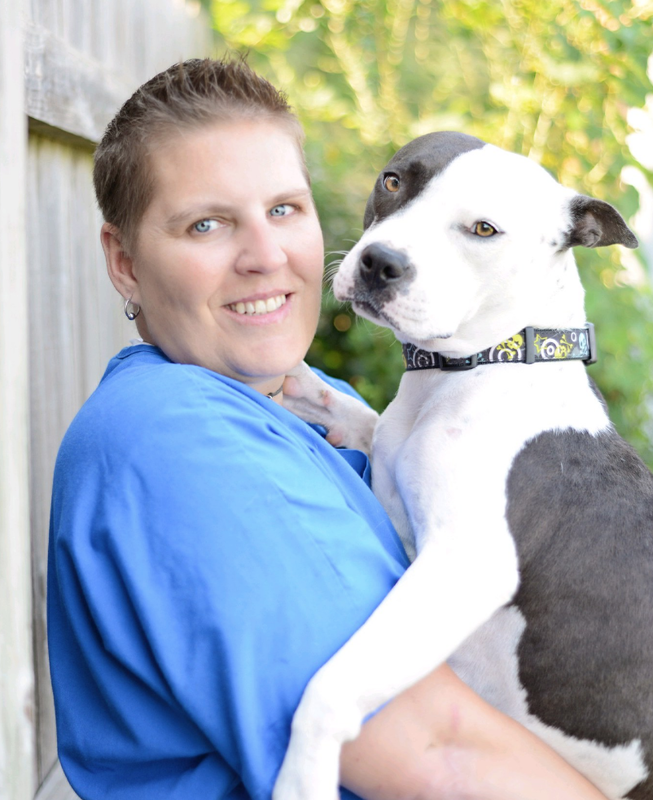 Brenda has been in the Veterinary field for 12 years. She moved to Fort Smith and joined the Labahn team in July 2018. She particularly enjoys getting to know clients and providing great client education. In her spare time, Brenda enjoys anything outdoors such as hiking, fishing, and kayaking as well as taking care of her Pitbull Harley and her 3 cats. Kayla recently joined the Labahn Team as a receptionist in July 2018. She is passionate about learning new things and meeting clients, human and animal alike. She graduated from NSU with a degree in Developmental Psychology and puts her skills to use every day by greeting all who walk through our doors. She has three kids (one human son and two cats; Alex, Violet-pictured, and B-la-ke). In her free time she enjoys reading, spending time with her kids, and being crafty.